Farmers in Nigeria weigh their dual-purpose chickens. In most of the developing world, poultry farming can contribute significantly to rural household incomes through the sale of eggs and chickens. Dual-purpose chickens, newer breeds being promoted across many African countries, gain weight quickly and produce more eggs while requiring fewer resources than local breeds. Many international development initiatives are increasingly encouraging poultry-rearing as an approach to poverty reduction. Further, given poultry-rearing tends to be a female activity, there is growing interest in if improved access to poultry can enhance nutrition and women’s empowerment outcomes. That said, many communities have not yet widely adopted hybrid chicken breeds. There is also limited evidence regarding the efficacy of for smaller farmers. Acumen, in partnership with the Bill and Melinda Gates Foundation and the World Poultry Foundation, is investigating whether ownership of dual-purpose chickens—which gain more weight and produce more eggs faster than local breeds with similar resources—can increase the income, nutrition, and women’s empowerment outcomes of small holder farmer households. 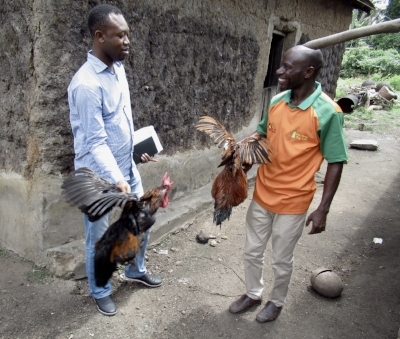 IDinsight is assessing the potential of these dual-purpose chickens in coordination with three private-sector poultry companies across Nigeria and Tanzania. The results of IDinsight’s evaluations will inform future investments into expanding access to chickens across sub-Saharan Africa. IDinsight will conduct impact evaluations in Nigeria and Tanzania on the effect of dual-purpose chicken ownership on household income, nutrition, and women’s empowerment.